Doctor Who: Series 9 Finale - Clara's Final Moment? | Warped Factor - Words in the Key of Geek. Doctor Who: Series 9 Finale - Clara's Final Moment? Tony Fyler takes a Moment. There's nothing like a bit of mad fan speculation to relieve the pressure of waiting for the Doctor Who finale. We're getting teased to absolute madness with elements. Obviously we're back on Gallifrey. The Hybrid is destined to conquer Gallifrey and stand in its ruins. We know 'The Hybrid is me,' though whether that's 'me, a name I call myself,' or Me, the ex-Viking, Mire-enhanced immortal teenager with serious forgetfulness issues remains to be seen. The Next Time trailer showed an Angel, a firing squad and a chamber in which 'regeneration is in progress.' If you're reading this, there's every likelihood you've watched the Moffat and Capaldi introductions to the episode, and the clip that has a Gallifreyan guard going down to the Matrix and encountering 'Cloister-Wraiths' - shadowy Time Lord shapes. One thing remains the subject of no contemplation whatsoever. Let's put a stop to that right now. 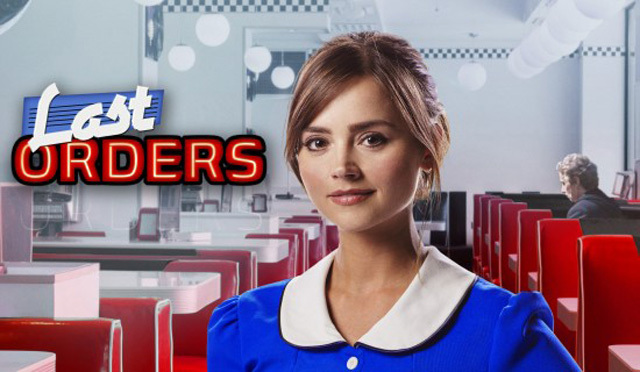 In among all the Gallifreyan malarkey, and Me suddenly turning up again... what the hell is Clara Oswald doing alive and dressed as a diner waitress? Hopefully it's not too much of a spoiler that Clara's in the final episode - she's on the cover of DWM dressed in a Tardis-blue diner waitress outfit. In a diner. And she has some dialogue. Now, there's no hint that the Doctor stops off for waffles on his long march from the wilderness to the capitol. So...what? Peter Capaldi says in his introduction that the Doctor is 'battling himself.' What with all the Matrixy, Cloister-Wraithy business going on, it's beginning to look a lot like Valeyard. BUT - what do you need to conquer Gallifrey? You need the ultimate weapon. And no, we're not talking about a mega-byte modem. The thing is, if you're about to use the ultimate weapon, what do you need? You need it to have a conscience. You need your best friend to tell you not to. To tell you you're being an arse, and that you didn't win all those times just to lose yourself to grief and pain and fury. In the moment of choice between destruction and forgiveness, you need your better angel to bring you back to yourself. Anyone know of an ultimate weapon with a conscience, that can take the form of your best friend in the universe and show you what you need to see before you press a great big threatening button and lose yourself in fury? Ideally somewhere in the Gallifreyan wilderness? Maybe in a farmhouse? Bear in mind this is blind speculation. But maybe the Hybrid, somehow, really is the Doctor after all. Maybe the Doctor's Cloister-Wraith is waiting for him, Watcher-style, to make the ultimate move, to stumble and fall to the darkness inside himself. And maybe, just maybe, the Doctor takes a Moment on his journey, to listen to the Impossible Girl one last time.